← Oufti! Ca c’etait un bon weekend! 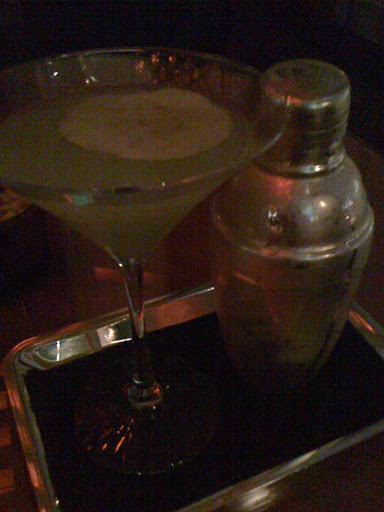 The Apple Martini at the Blue Bar is perfectly balanced, sweet (but I like it that way), flavourful, and fresh. It’s not too strong, which actually works in your favour, because it’s so morish you want to have at least 3 of them if you can. Made with vodka and fresh apple puree, then topped with a very thin slice of dehydrated apple, one could almost deem it healthy! The puree gives it dimension, and I almost feel like I’m having a snack at the same time! And for one more special touch, it’s served on a barman’s tray, together with the cocktail shaker. They pour it into the glass at your table, then leave the shaker with you, which contains almost another full glass of the martini mixture. Talk about two for the price of one! Please, do me a favour, go have one, and tell me you love it just as much as I do! P.S. I apologise for the poor quality photo. I forgot my camera at home, and the Iphone 3 picture quality leaves much to be desired!